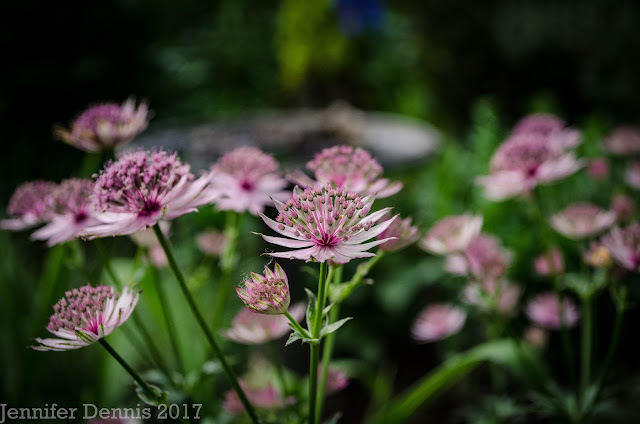 It's the 15th of the month so that means it's time to showcase what is blooming around the garden in the fine month of June. Thanks to Carol at May Dreams Garden for hosting this monthly meme! We are having a more typical 'Oregon' spring this year. It started with a very wet March and April, a glimpse of nice days in the end of May and as soon as the famous Portland Rose Festival started...we got the June weather 'low', usering in cool days with some moisture. It's been a while since we've had a typical Oregon spring; one thing for sure..the weeds love it. 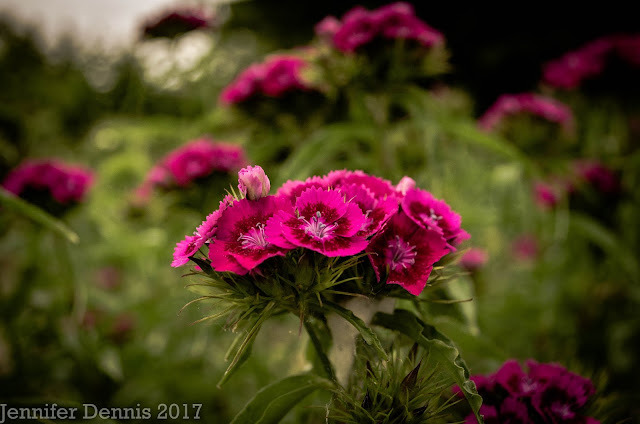 My spring blooms have consequencely been later this year, but the cooler weather has been good for stretching out those blooms for a longer period. My astrantia plants have flourished with the cooler spring. Above is 'Roma' a staple in the masterwort world. It's silvery-pink color reminds me of the colors of fairy dresses. 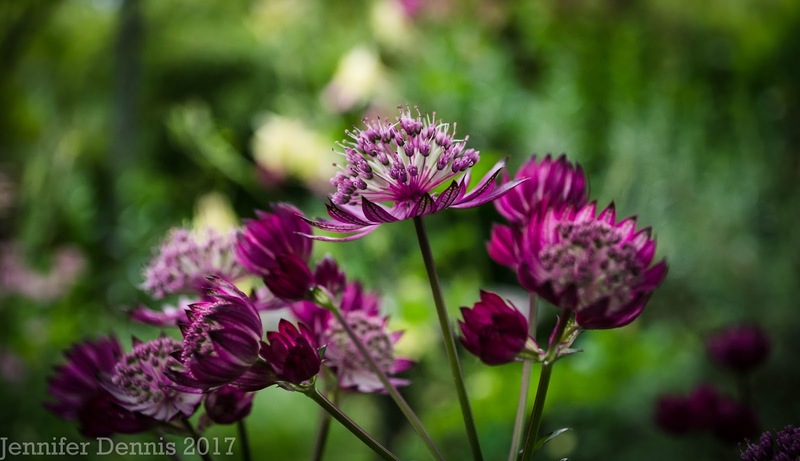 Below is astrantia 'Hadspens Blood'. Yes that rich color is real. I need a few more of these babies. This combo of Trollius chinensis and Aquilegia (columbine) is quite pretty. I love a buttery, yellow color in a bloom. 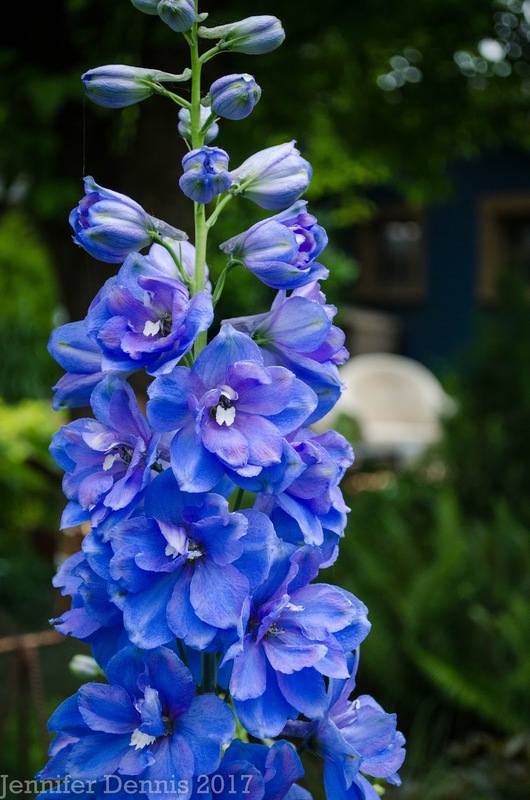 And another hit this year, and also likely due to the cool spring is the gorgeously full delphinium. 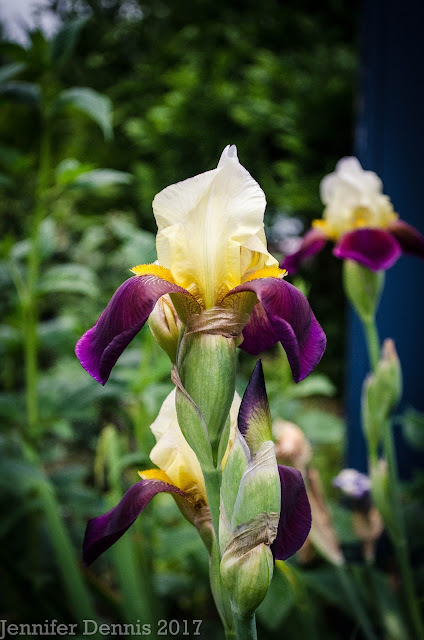 The funny thing about my collection of iris is that they've all been gifts from other gardeners collections. 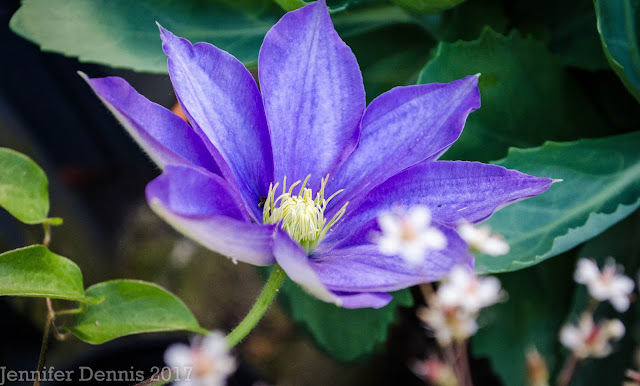 I was able to enjoy nearly every type of bloom that I have...but I only got pics of a few. June has been good for blooms. But, I'm looking forward to the warmth of summer. Oddly, other than the buttery yellow aquilegia, my aquilegia really didn't perform well. That was disappointing. 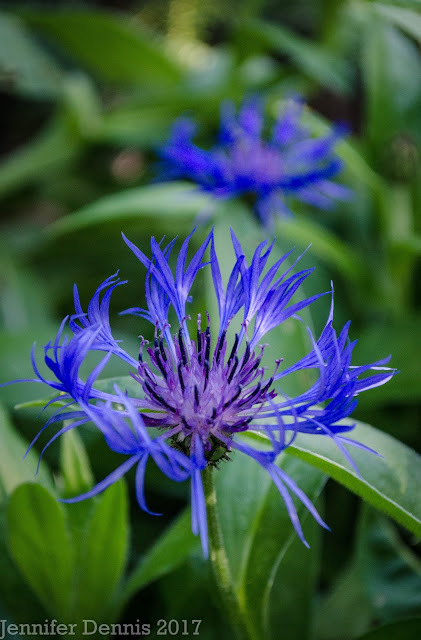 New to the garden this year is centaurea 'Montana'. Why did I wait so long before I purchased this plant? I love it! Looks like the Cape Fucshia's are getting ready to fully bloom! The hummers will enjoy. 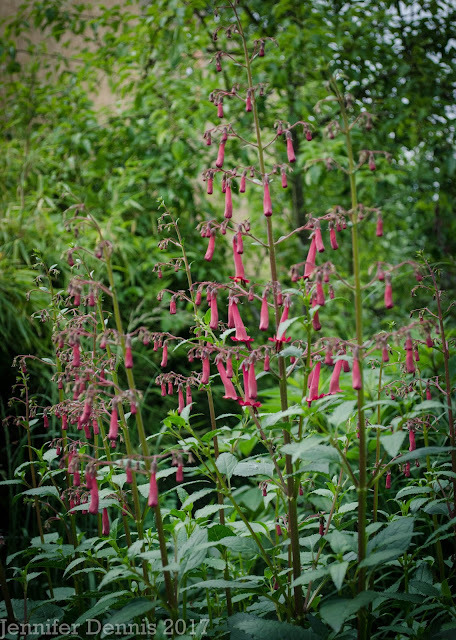 The cape fucshia is not the easiest plant to keep under control but nothing attracts hummers quite like it. So, I hack it down every winter and try to keep in tamed. 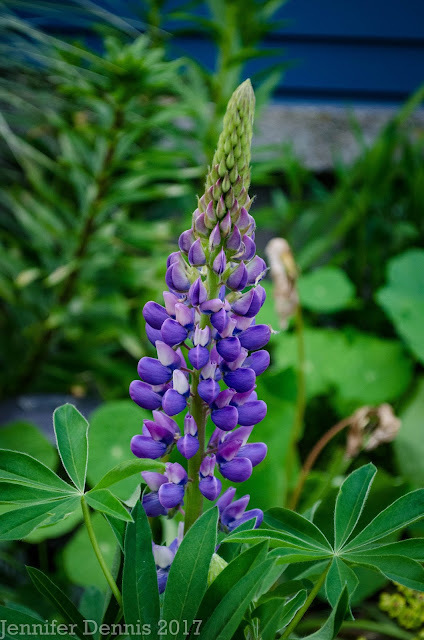 My cottage gardens would not be complete without lupines. Here are some pics of the garden in late May and early June. Wishing everyone a Happy Garden Bloggers Bloom Day! I am hopeful that summer will be here soon! I love your photos - they are so vibrant and beautiful. Cape Fuchsia - I just dug mine up and put it in a pot after hearing so many horror stories. I can't wait to see the blooms and the hummingbirds. Beautiful! 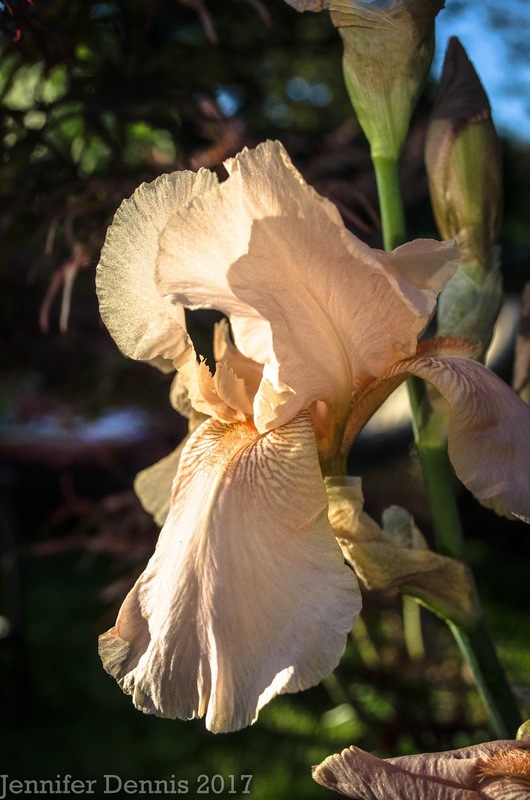 Love all the Iris! 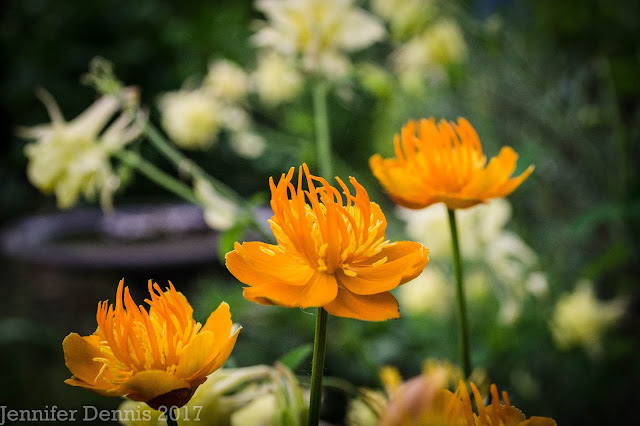 That Trollius /Aquilegia combination is very nice ! 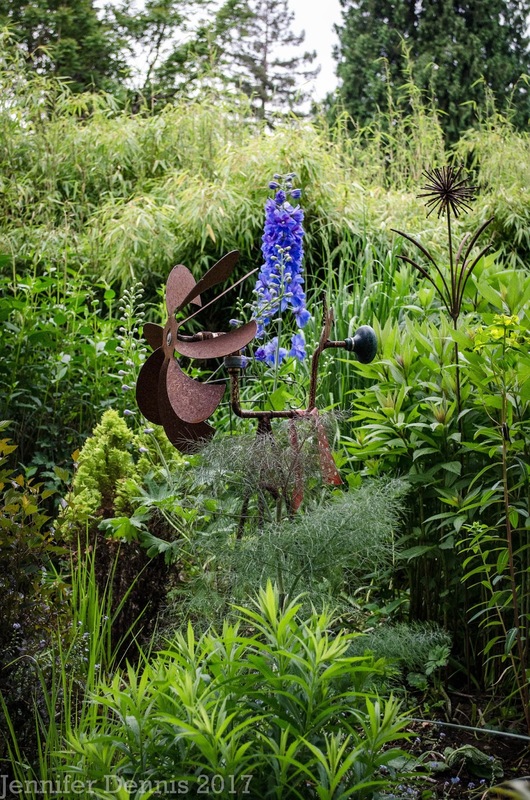 The rain that never stops this year is very welcome in my dry garden . Happy Bloom Day ! Lots of gorgeous blooms! Delphinium, Trollius, Peonies, and Lupines remind me of Alaska gardens and make me a little homesick. 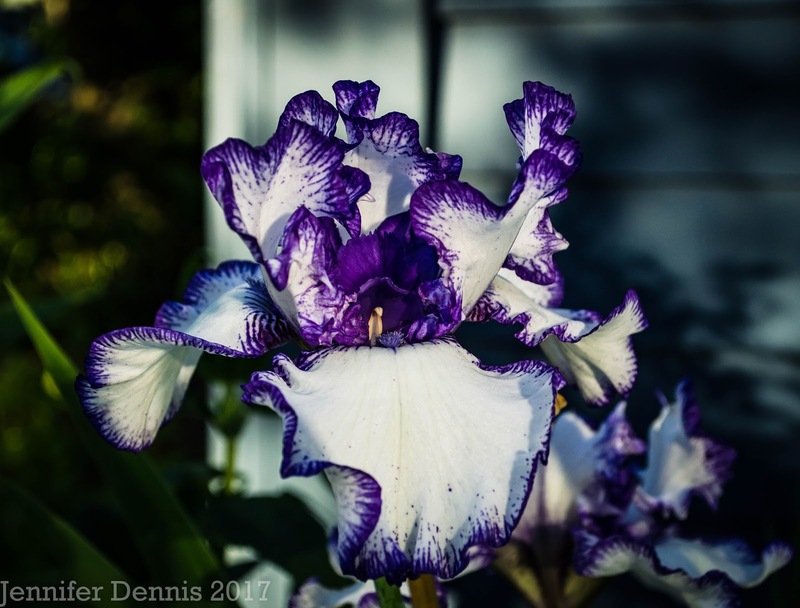 The purple-edged white iris made me a little weak in the knees. Stunning! Peter..I had no idea I had a purple and white iris. Isn't that hilarious?! 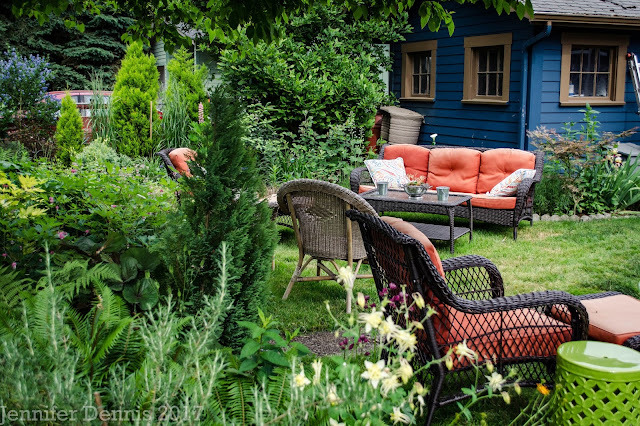 Your garden looks like such a lovely place to sit and relax! Your garden is looking lovely! So many colorful flowers. It must be so peaceful to sit out there. They have done really well this year. The bloom lasts a long time. The rusty plant stand for your Delphinium really captivates me. 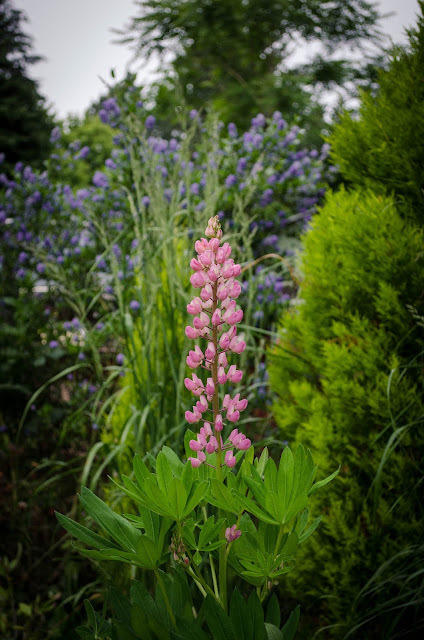 Your garden looks so beautiful with all its June bloomers. That wide shot depicts a garden with lots of conifer enclosure. At least you still have it on one side. Your garden is incredibly beautidul! 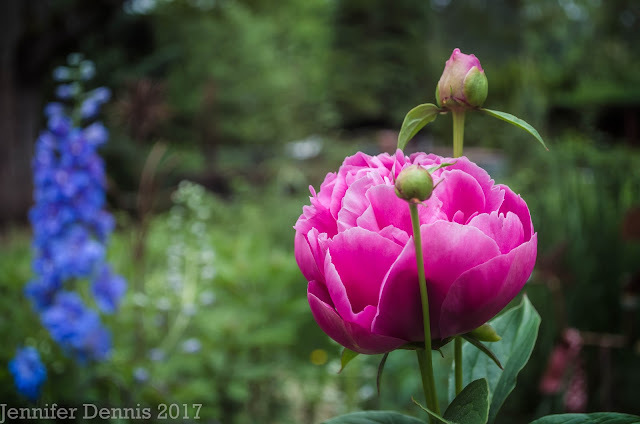 those Peonies and Delphiniums are splendid, I wish I could grow those plants in my garden but I live in a warm subtropical region. Greetings from Argentina.